State Rep. Oscar Longoria, center, and members of the La Joya Housing Authority, hand out turkeys Wednesday at the housing authority office in La Joya. LA JOYA — La Joya Housing Authority board members distributed turkeys to residents this week, taking a break from the turmoil surrounding the termination of their interim executive director earlier this month. Additional items the housing authority gave low-rent program tenants were ready-to-bake rolls, cans of green beans and corn, and boxes of stuffing. Giveaways were conducted Tuesday and Wednesday afternoon. The turkeys that were handed out on Tuesday were donated by La Joya school board trustee Alex Cantu, his wife Vicky Cantu, and Juan Jose “J.J.” Peña — also a La Joya school board trustee who was elected earlier this month the Precinct 3 Justice of the Peace. 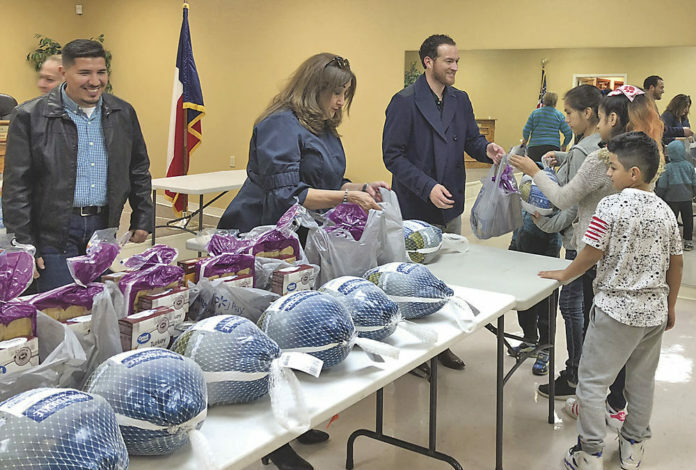 The turkeys handed out on Wednesday were donated by state Rep. Oscar Longoria, D-Mission. The event was organized by Sylvia Garces-Valdez, the board vice chair, who said she wanted to help residents whose children would be out on Thanksgiving break. To put it all together, she said she reached out to political community members for donations. “They were more than willing to donate,” Garces-Valdez said. Some of the people she reached out to asked if they could give a monetary donation, which was met with a resounding negative. A transaction list of expenses posted to their low rent program from Jan. 1 to Oct. 24 detailed questionable expenses, including ATM and cash withdrawals totaling more than $10,500. The attorney for former interim Executive Director Frances Salinas said the board had approved those transactions. The board, however, denied ever doing so. The giveaway was a distraction from those troubles but also served as a way for the residents to form a connection with the board and with each other, according to Maricruz Sifuentes, the board chair. Garces-Valdez said she was shocked when one of the tenants asked if they were allowed to enter the board chamber within the administrative building of the housing authority.